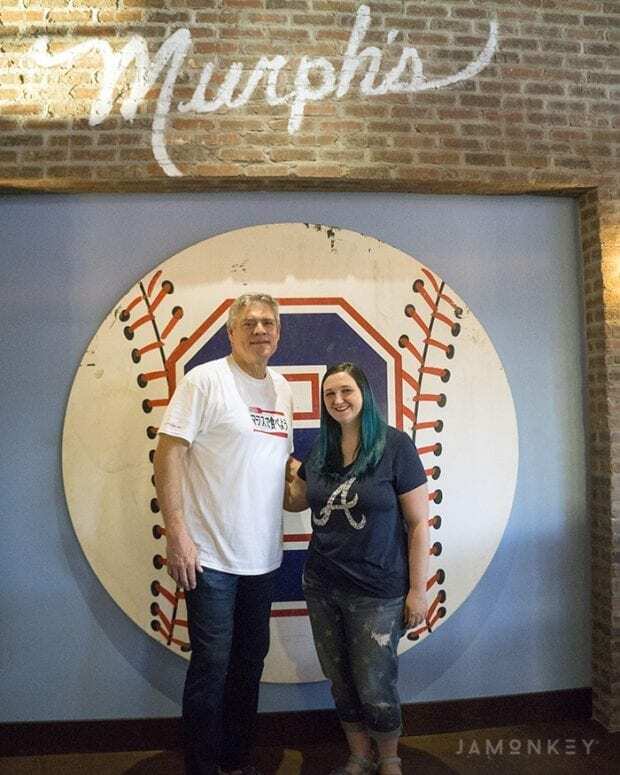 This week I got to meet Atlanta Braves MVP Dale Murphy at his new restaurant in Atlanta near SunTrust Park called Murph's. What a nice guy! I went with a friend of mine, and we ate food until we popped and talked baseball over dinner. It was a total cheat night for me, and it was well worth it. I tried things I would never have ordered on my own, and I was pleasantly surprised how much I enjoyed them. 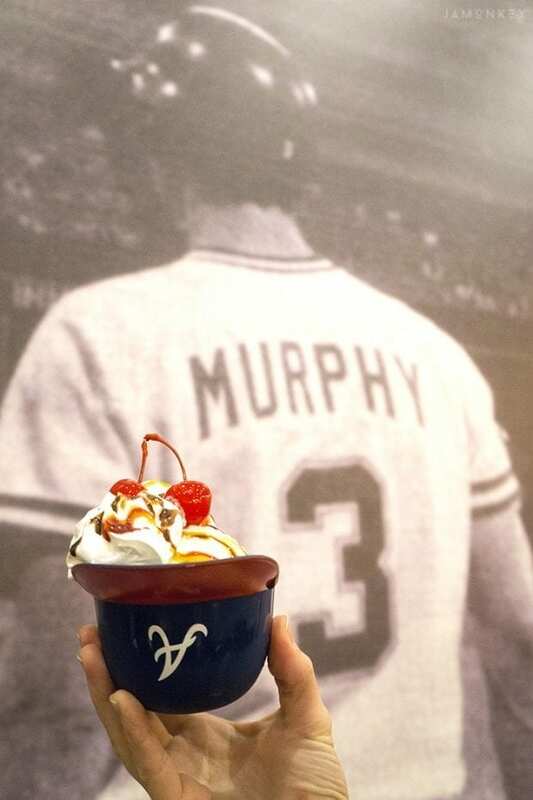 Murph's is located in the Cobb Galleria Centre and has a handy pedestrian bridge that takes you right over to The Battery in front of SunTrust Park. I have to agree with Dale Murphy about the great area they have made. “They have created an unbelieved experience for fans,” Murphy says. There is so much to see and do in the area; it really was the perfect place for the former player's new restaurant. I'm sure you're wondering what some of these food items I tried were. Let's start with the appetizers. I was very excited to try the Artichoke Heart Quarters. They are hand battered in house and served with the secret comeback sauce. 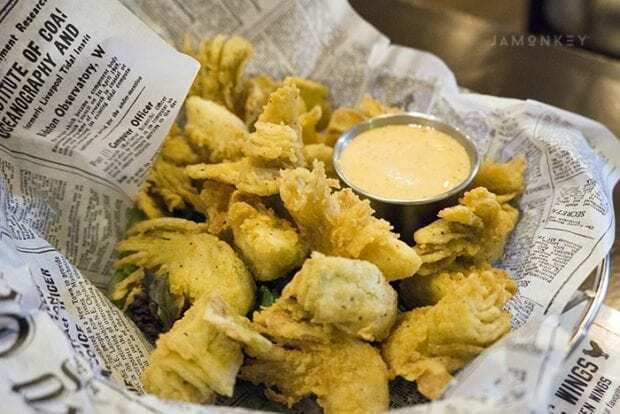 I LOVE artichoke heart in just about everything and there are a couple of items on the menu with them. Another one that I tried was the Chicken Artichoke and Pesto sandwich. Blasting with flavor, this was a tasty one. Murphy spoke to us about how fun it was trying new foods for the menu. I bet that is any restaurant managements favorite part. He did mention that the one thing he had to have on his menu was fried okra. For the main course, we wanted to know what Murphy's favorite thing on the menu was. 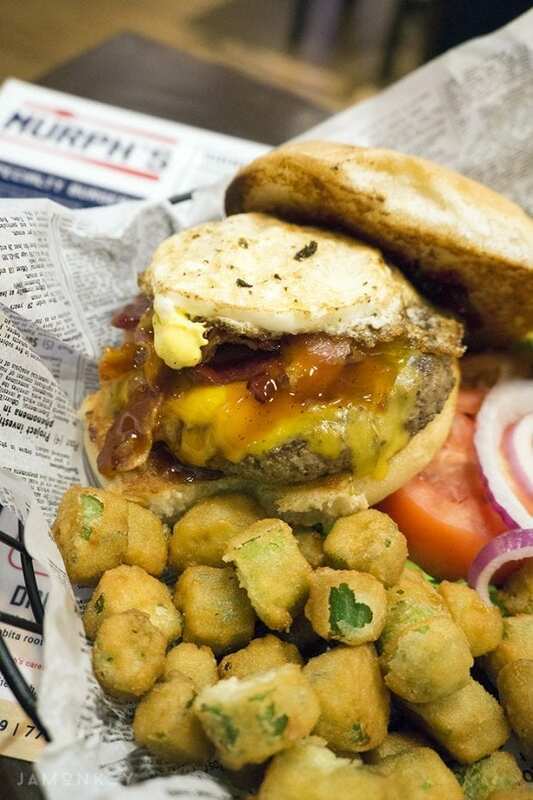 Which happens to be the Bourbon Bacon Burger, “Murph's Way.” While the burger is on the menu, the special Murph's Way is a hidden menu item that you'll need to request. You can add it to any of the sandwiches or burgers and it is some pepper jelly and a fried egg. If you know me personally you may know that I don't like bacon. I know, people tell me all the time I'm crazy. I'll eat it but I would prefer to leave it out because it makes everything taste like bacon also. But I wanted to try Murphy's favorite just the way he likes it and I was so surprised to realize I loved it. I always thought it was weird to get a fried egg on a burger but it works! We had to get a fun dessert in a Braves Helmet of course. I also tried a fried Twinkle that tasted like a creme filed churro and was pretty yummy. After eating way too much, Murphy took us around the restaurant and looked at all the great pictures on the wall of his career stemming back to Little League as well. We took turns trying to guess which of the kids he was on the team. There is a little store set up in the restaurant as well where you can find great merchandise, including autographed memorabilia. What I loved most was how kind Murphy is with all of his guests. He made sure to visit every table and say thanks for coming and. He would pose for pictures in the official selfie spot as well. It gave me the warm and fuzzies seeing how much he cares. Murph's was really delicious and I highly recommend anyone in the area to check it out. Especially if you are a big Braves fan and are only in the area for a game. You can park at the Galleria and easily get to the game and yummy eats all at once. Visit Eat At Murph's to find out more. You can also book parties at Murph's, they have a great private area that holds about 24 people.